THE JAZZ COMPOSERS COLLECTIVE The Herbie Nichols Project cassette release! 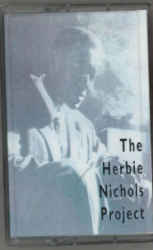 THE JAZZ COMPOSERS COLLECTIVE introduced the Herbie Nichols Project in 1994 to introduce the long-neglected music of this great American composer to musicians, audiences and record collectors; and to arrange, perform and record his work with horns. The Herbie Nichols project is a repertory band committed to annual performances, multiple recordings and unearthing never-recorded Herbie Nichols gems from the Library of Congress. Co-led by Frank Kimbrough and Ben Allison, the latest recorded incarnation of the group includes Ron Horton on trumpet, Ted Nash and Michael Blake on saxophones, Wycliffe Gordon on trombone, and Matt Wilson on drums (though roughly twenty players have participated in it at one time or another). January 3rd was Nichols Centennial / when phil was 10 the short-lived HERBIE NICHOLS (1/3/1919 - 4/12/1963) helped young Phil get home from a nightclub and gave him the Sunday Times and New York Herald Tribune's sports sections. This cassette is the band's first release!